So, as a transition to a piece on liberal environmental issues, Champion segued, "And now to our series 'Global Warming: Global Warning.' Could global warming one day force us into space to live?" (The ABC weatherman appeared in a pool as part of a previous space segment on weightlessness.) Champion used the segment to preview a new documentary called "Six Degrees" that will air on the National Geographic Channel on Sunday. He failed to inform viewers that the author upon which the special is based on, Mark Lynas, is a hard-left environmentalist who once threw a pie in the face of Bjorn Lomborg at a reading of Lomborg's book, "The Skeptical Environmentalist." Speaking of the famous pie throwing incident, Lynas, in another interview, has justified attacking someone who disagreed with him: "I wanted to put a baked Alaska in his smug face, in solidarity with the native Indian and Eskimo people in Alaska who are reporting rising temperatures, shrinking sea ice and worsening effects on animal and bird life." Together with clips of Lynas from the documentary, Champion proceeded to offer hyperbolic panic about the end of all life. He intoned, "If the world warms by six degrees, it would be the ultimate climate disaster...Natural disasters become routine and catastrophic flooding leaves major cities abandoned." Champion also followed the Al Gore model and claimed that all disagreement on the subject has ended. He asserted, "The debate put aside, scientists now agree our world is getting warmer." Of course, even Champion was forced to admit, in a circuitous manner, that there has been relatively little change over the last millennia: "In fact, it's nearly one degree warmer than it was a thousand years ago." It’s one thing to portray a doomsday scenario as it would happen unless drastic action is taken when it comes to global warming. It’s been done over and over. But Mark Lynas, author of "Six Degrees: Our Future on a Hotter Planet," took a different approach. Lynas, who is actively campaigning for government "solutions" to combat global warming, presented what he acknowledged were unlikely scenarios in his book and movie to create a sense of climate change panic. At the segment's close, Sam Champion lobbied for a blame-America approach. Absolving China, he lectured, "And the truth is, [cutting carbon emissions is] for us to do as the largest emitter of carbon pollution." It's hard to believe that Champion could top previous hyperbolic segments. (This is the same person who in early 2007 hosted a piece which wondered if "billions" could die from global warming.) But by speculating about the need to abandon Earth, he has indeed raised the bar. MARK LYNAS (Broadcast commentator, journalist and author): At two degrees of warming, the impacts in the marine ecosystem are going to be much more severe. We're likely to lose the vast majority of the world's tropical coral reefs. CHAMPION: At four degrees warmer, oceans submerge Venice. Himalayan glaciers recede and the Ganges River runs bone dry. Tundra in northern Canada is fertile farm land. The ice sheet covering western Antarctica collapses, bringing sea levels three to four feet higher. If the world warms by six degrees, it would be the ultimate climate disaster. Teeming blue oceans become underwater wastelands. Natural disasters become routine and catastrophic flooding leaves major cities abandoned. LYNAS: If temperatures soar by six degrees within less than a century, that we are going to face nothing less than a global wipe out. CHAMPION: But scientists say it's not too late if the world curbs its energy consumption by 2015. In developing countries like China, the problem is particularly urgent. LYNAS: I don't think we can turn around to the Chinese and say, "I'm sorry, we need to save the future of the planet." Rich countries have to take the lead and we have to cut our emissions in a more dramatic sense in order to allow some room for growth in the poorer countries. CHAMPION: And the truth is, that's for us to do as the largest emitter of carbon pollution. 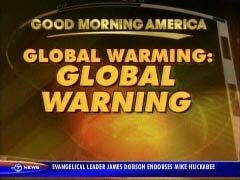 For more information on global warming, you can hit us at ABCNews.com. To watch the special "Six Degrees," it's on the National Geographic channel on Sunday.